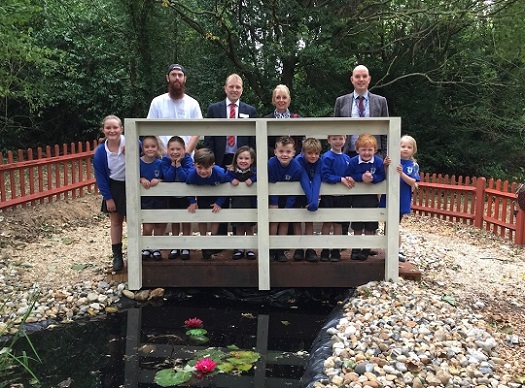 Supported by money from the Toyota Fund For A Better Tomorrow, Rocks Park have completed their new outdoor learning pond areaHere at SLM Toyota Uckfield we are extremely pleased to provide an update from Rocks Park Primary School. Earlier this year we were able to donate £1,750 from the Toyota Fund For A Better Tomorrow to help the Uckfield based school restore and improve their pond area. The pond was out of bounds but is now restored for the children to enjoy. Paul Hardwell, General Manager and Mel Ball, Marketing Manager at SLM Toyota Uckfield recently visited the improved outdoor area to see how much it has changed. The area around the pond has been cleared, whilst the pond itself has been refurbished along with a new bridge over the top for safe pond-dipping. Parents at the school Will Hunt and his wife Leah led the project, along with other parents and children to create such a fantastic outdoor area for the kids. There is also a mud kitchen, fantastic for messy play. Both the kitchen and pond are situated next to their outdoor classroom, all linked by safe paths. The school's Head Teacher Andy Best explained: "It is the grant, along with the drive and knowledge of Will and a landscape gardener, that has allowed us to do this." Mel Ball added "We will be able to apply again for grants from the Toyota Fund for a Better Tomorrow and do hope to continue our connection with the school." Everyone at the dealership is delighted to be involved in such a fantastic local project and we can't wait to see how the school's facilities develop in the future!